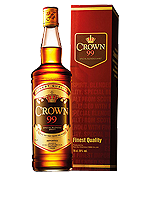 Crown 99 | Thai Spirits | International Beverage Holdings Ltd.
Crown 99 whisky is a blend of imported Scottish malt whisky and locally produced grain spirits. Launched in early 2000. Crown 99 has been highly successful in the Thai spirits market, establishing itself as segment leader and now making new forays into the broader Asian market.